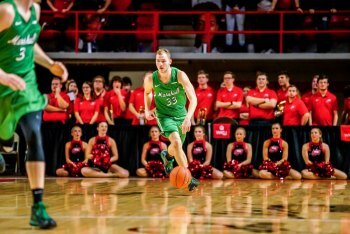 BOWLING GREEN, Ky. – Marshall men's basketball (12-7, 5-1 C-USA) fell at Western Kentucky (10-9, 3-3 C-USA), 68-59, as the Hilltoppers made a late run Saturday night at the E.A. Diddle Arena. "They (WKU) played well," fifth-year head coach Dan D'Antoni said. "It was a crowd. I enjoyed it. It was a great game to coach in." Senior guard Jon Elmore led the Herd with 17 points while grabbing five rebounds. Senior guard C.J. Burks fell two rebounds short of a double-double with a team-high eight rebounds to go with 13 points. Freshman guard Taevion Kinsey led Marshall with a career-high four assists, as sophomore Jannson Williams had a game-high three blocks and sophomore Jarrod West tied his career-high of five steals. The first-half was sloppy both sides. The Herd missed its first 13 shots before making its last three to end the half, including one near the buzzer by West, as he was missing one of his shoes, to put the Herd up 25-24 at halftime. Marshall forced 15 turnovers in the opening half, while giving up the ball 10 times. The Herd shot 32.3 percent from the field, while WKU put up a 34.6 shooting percentage at the half. The Herd started the second-half on a 9-2 run to extend its lead to eight points, 34-26, its largest lead of the game, with 17:52 remaining in the second-half. Marshall maintained its lead for the majority of the half until the Hilltoppers tied it at 46-46 on a three-pointer with a little over seven minutes on the clock. The Herd answered with a 7-0 run to lead 53-46 with 6:18 left in the game. WKU went on a 14-0 run across the next five minutes and Marshall was unable to recover as the Hilltoppers led the rest of the way. - Jarrod West collected his third-consecutive game of five steals and eclipsed the 100 steal mark for his career. - Jon Elmore made four three-pointers and is now two away from breaking Austin Loop's program record of 293. - C.J. Burks eight rebounds are a season-high. - The loss snapped a streak of 30-consecutive games won by the Herd when it led at halftime. The Herd head back on the road to continue the middle game of a three-game road swing at Louisiana Tech Thursday (Jan. 24).